What size of companies are the most profitable? I often read about large companies that are in major trouble. According to the theories of economies of scale/scope large companies should, almost by definition, be profitable. t also seems like the only thing on the mind of business leaders is to grow the company. My question is therefore, are companies with many employees generally also more profitable, measured as profitability per employee. I am also wondering whether companies with higher income are generally more profitable (profit as a percentage of income). Maybe the perfect sized company has 10 employees? One answer is this: without employees, you probably don't really have a company, you just have a job. That's not ALWAYS true, but it's often true. Company A has 150 employees and earns $1M net profit per year. Company B has 30 employees, and earns $1M net profit per year. Technically, they are both equally profitable because they earn the same net profit per year. However, the one with 30 employees is probably a lot less of a headache for the owner(s) to manage. Sometimes when people use the word "profitable" they are referring to return on sales or return on capital. Those are altogether different questions. With a very broad stroke, larger firms have more revenue per employee than small ones. Last time I looked, the smaller companies in the Software 500 was around $100K and the larger ones was more like $250-300K. To benchmark your industry, go to hoovers.com (or like) and sample a sizable number of companies then do your your own simple math averages. However, that's total revenue numbers I did a while (around 2008) ago. As for profitability, given that smaller firms are continually re-investing profits, which really means pushing their expenses as far as they can, and often into the red, I'd actually guess it's also lower for smaller companies, not higher as many are relating here. Furthermore, with company size comes the ability to do exponentially more, both from a business point of view, and also lobbying, legislation, strategic partnering, various "polys" like monopolies, oligopolies, etc. There are anecdotal exceptions either way, of course. UPDATE: Another common reason why larger software companies are more profitable is that in a small/startup company, you have 2 devs at $100K and (very) minimal supporting staff bringing in, say, $300K in profit. Whereas in a medium company, the pool of high IT expense, while bigger, begins to be diluted by the larger-but-cheaper staffing for selling and supporting the product in a bigger market share. One measure of success is the income generated per imployee. The highest amounts here that I have heard of come from very small software companies. There are a number of smallsoftware firms that generate nearly $1,000,000 per employee per year. 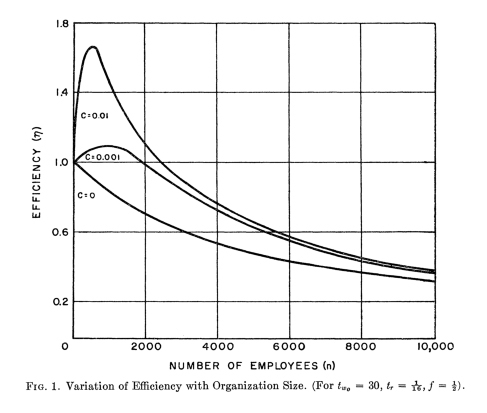 I'm not sure about profits per se, but this study found that productivity peeks at relatively few employees. Here's a graph from the summary. A perfectly-sized fabless startup cannot be less than 20-30 engineers, because it requires a multi-disciplinary team to develop a chip: IC designers, verification engineers, SW people, at least one PCB designer that does the prototype board. In SW business the picture is very different, early Microsoft is an example. I almost hate to put it this way.... but... as the saying goes... "size doesn't matter". What matters is the value you're delivering for your clients. If you start with that - and you complement that with thoughtful financial management - you can create remarkable margins and value for you and your stockholders. 3 What tactics did Facebook or LinkedIn or Bebo use to grow?